Victor Michael West is of Tlingit, Cree and Irish ancestry and currently resides in Vancouver, British Columbia, Canada. Victor’s life began on a Yukon trap line. Seasonally nomadic, his family travelled consistently, to and from the Yukon and Edmonton and on to Forestburg, with summers on the west coast of Vancouver Island at Toquaht Bay. When his family settled down Victor continued to travel and spent most of his time in the bush, exploring the Kananaskis Valley, the Rocky Mountains and the foot hills. As a young adult he circled back to the Yukon and then to the west coast where he prefers to be. His awareness of his ancestry grew from his experiences during his extensive travels. While preferring red and yellow cedar, Victor works in many different mediums. 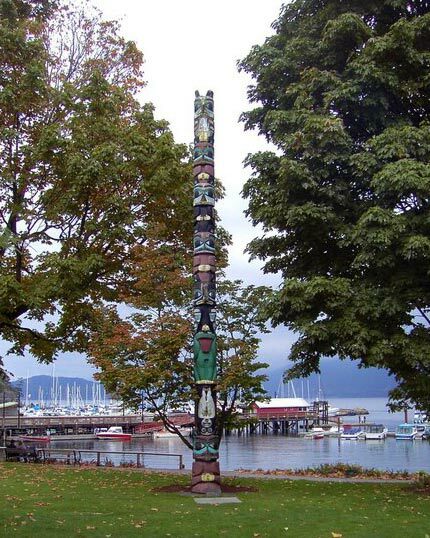 His work depicts images of Eagle, Raven, Killer Whale, Wolf and others together with smaller Salmon-Trouthead designs. 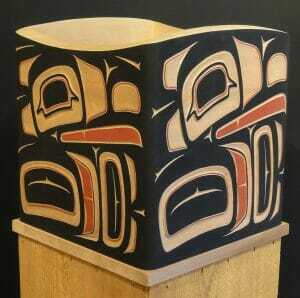 His carving is inspired by the old Tlingit bentwood boxes. All details of his work are meticulously carved in precise relief and finished with clean and sharp paint work. He prides himself in his work which he pursues enthusiastically. Although a self-taught artist, Victor credits First Nations masters Bill Reid, Robert & Reg Davidson, Charles Edenshaw and Dempsey Bob with inspiration.